The error code 0xc0000034 (Boot Configuration File is Missing) is one of the annoying blue screen for deaths associated with some Windows operating systems. Users tend to encounter this error code when starting Windows. The system does not boot and the screen turns blue or black. Normally, there is no way to solve this problem and no other explanation of what this error really means and why it occurs. One of the most common causes of this error are boot files, which are either missing, corrupt or misconfigured. This may occur due to hard disk write errors, power failures, boot sector viruses, or errors in the manual configuration of these files. This error code appears on a Blue Screen of Death and Windows cannot start normally, which is scary enough for most users. Fortunately, there are solutions to repair it safely. If you have difficulty correcting error 0xc0000034, please read on to find solutions. How to correct error code 0xc0000034 on Windows? Reboot your computer with the original Windows Vista installation disk and boot from the disc. Click Repair Computer Install Windows Vista screen. Replace c: with the drive letter where your Windows Vista is installed. Step 1: Boot your computer from the Windows installation media. Step 2: Click Next -> Fix Computer -> Troubleshooting Issues -> Advanced Options -> Command Prompt. 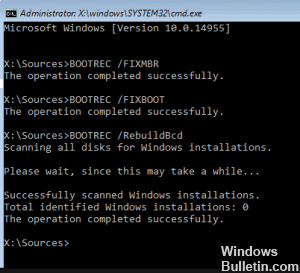 Step 3: In the Command Prompt window, type the following commands and press Enter after each command. Step 4: When the above commands are complete, type exit and press Enter. Then restart the computer to check if the 0xc0000034 error has been corrected. 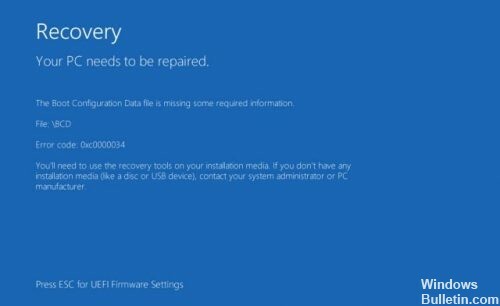 Boot into the recovery environment using Windows installation media. For the solution to work, you need your Windows installation media, which can be a CD, DVD or USB stick. Start in the installation media, and when you press any key to boot from a CD or DVD, click any key on your keyboard. Click Next, and then click Repair Computer. In addition to Troubleshooting > Advanced Options. Now click Auto Repair and select your operating system from the list. Windows will now check your operating system for problems and try to resolve them automatically. This whole process could take some time. Sit back and relax. If Windows cannot resolve your boot problems, try the following solution.